Memory Cards & USB Pen Drives. Memory - SD & SDHC. PS4 & PS3 & PS2. PSP / PSP Lite / PSP Slim. In Car DC Power & Accessories. GoPro & Action Cam Accessories. Action Cams & Dash Cams. Camera - Audio Video Cable. Portable Power & Power Banks. USB & In Car Chargers. Camera Travel Cases & Backpack. Lens Caps Hoods Covers Filters. Laptop / Tablet Case & Covers. 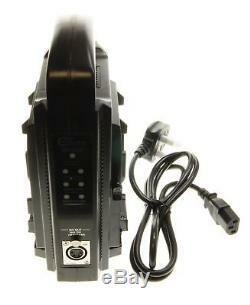 Ex-Pro BP-150W 150wh Camera V Mount Lock Li-ion Battery x2 +Dual Channel Charger. 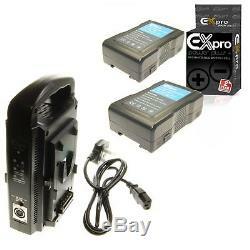 Ex-Pro® V-Mount (V-Lock) Dual Broadcast Battery Quick Charger with 12v XLP DC Output function & PACK OF 2 - Ex-Pro® replacement Li-ion Battery for Sony V-Mount Type Lithium-ion battery. 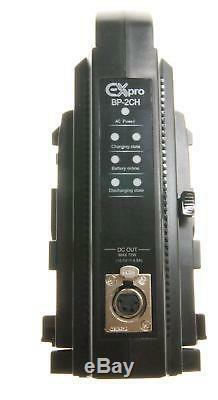 Charge V-Mount Broadcast batteries mains powered (IEC Cable) - ideal for all locations. 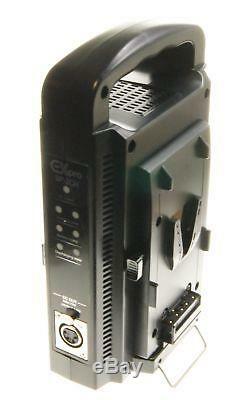 Quick charge 1 battery or sequentially charge 2 batteries at the same time, at normal charge. Charger is mains powered 110-240v with controlled MCU (Controller) to provide constant voltage reliable and efficient for charging this type of battery. Charges Li-ion V Mount Batteries. 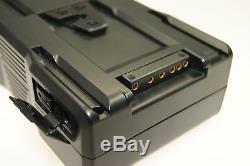 Charge 2 Batteries at the same time (Normal charge) Quick Charge 1 Battery. Efficient, Robust and Versatile DC 12v Output XLP connection - Please note this can not be used as the same time as charging (Charging will cease when 12v XLP is connected). XLP Output 12v can be used as a power source, connect 1 or 2 batteries and power your devices -LED indication for battery discharge. 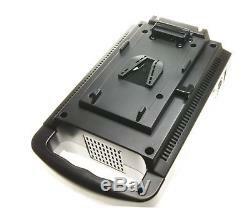 Fold out stands for Vertical charging stability. LED Indication Charge state/Discharge State XLP/Online V Lock V-Mount Series Charges :- Sony BP-65H, BP-90, BP-GL65, BP-GL95, BP-GL95A, BP-IL75, BP-L40, BP-L40A, BP-L60, BP-L60A, BP-L60S, BP-L80S, BP-L90, BP-L90A [BP-150W] 110-240v IEC UK Power cable inc DC XLP Output 16.5v 4.5A 16.8v 3A (Charging 1 Battery) 16.8v 2A (Charging 2 Batteries) 1150g - 141mm x 100mm x 225mm [LxWxH] CE Certified Product, UK Company, UK Support, Registered UK Battery producer Battery PACK OF 2 - Ex-Pro® replacement Li-ion Battery for Sony V-Mount Type Lithium-ion battery. Unit manufactured using Samsung UL Cells to the highest standard meeting or exceeding the original manufacturers specification and supplied with a 2 year RTB guarantee. Ex-Pro® batteries are fully tested and built with lithium-Ion technology to ensure maximum Power and battery life with zero memory effect and low self discharge. 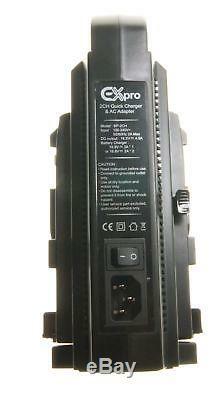 Ex-Pro® Fully Decoded Battery Technology. This high-performance battery from Ex-Pro® is comparable quality to the original, operation is the same. High-grade A cells with long life. Approved & environmentally friendly Ex-Pro® batteries are produced in accordance to EEC and CE approval guidelines, Registered UK battery producer. 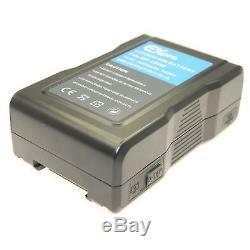 Battery Specifications Replaces :- Sony BP-65H, BP-90, BP-GL65, BP-GL95, BP-GL95A, BP-IL75, BP-L40, BP-L40A, BP-L60, BP-L60A, BP-L60S, BP-L80S, BP-L90, BP-L90A [BP-150W] Capacity :- 1040MAh Compatible with the following devices :- HDW-650P, HDW-730S, HDW-750P, HDW-750PC, HDW-790P, HDW-800P, HDW-F900R, HVR-S270E, PDW-510P, PDW-530P, PDW-700, PDW-850, PDW-F335K/2, PDW-F335L, PDW-F355L, PDW-F800, PMW-320K, PMW-320L, PMW-350K, PMW-350L, PMW-400K, PMW-400L, PMW-500, PMW-TD300, PXW-X500 Camcorders What's in the box? 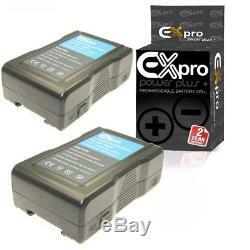 2 x Ex-Pro® Sony BP-150W, BP150W - 10400MAh High Rated Power Plus+ Lithium Li-on Digital Camcorder Battery. Additional Units of this item. SORRY, Personal collection not available. Best Sellers - Lowest Prices. Lindy NC-60 HQ Active Noise Cancelling Headphones with Travel Case and Adapters. Wireless Wifi IP Camera Webcam Baby/Pet Monitor CAM Pan Tilt UK BLACK. Hama Traveller Compact Travel Tripod 3D Pan & Tilt Head 43cm 16 Quality. Hama Classic DSLR Digital Camera Cleaning Lens Pen. Retro Vintage Black & White Flip Clock Time Desk. LINDY BNX-60 - Bluetooth Wireless Active Noise Cancelling Headphones with aptX. 10m x 6mmÂ² Professional Grade Low Resistance 770 Strand HiFi Loud Speaker Cable. Get in touch with us. The item "Ex-Pro BP-150W 150wh Camera V Mount Lock Li-ion Battery x2 +Dual Channel Charger" is in sale since Monday, March 6, 2017. 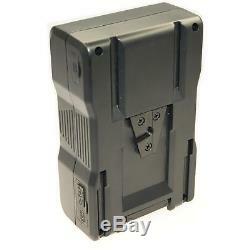 This item is in the category "Cameras & Photography\Camera & Photo Accessories\Batteries". The seller is "directcal" and is located in Cleveland. This item can be shipped worldwide.